Soundsgood 1.1 has arrived! Spread your playlists across all music platforms, Embed a smarter player & More. Because playlists are the ultimate way to enjoy music online, we craft Soundsgood to provide the best playlist curation service for influencers. Amazing things are planned for 2016, and we are happy to kick things off with the release of Soundsgood 1.1 aka SpaceOddity . This version of Soundsgood comes with a new killer feature: you can nowpublish and synchronize your playlists across all music platforms. We have also designed a smarter cross-platform player for your website and social networks. Mobile listeners can finally save your playlists no matter what music app they use! At last, we have enhanced the playlist editor to give you a complete control over your playlists availability across music platforms. There is so much to explore in Soundsgood 1.1, so let’s jump into the details! 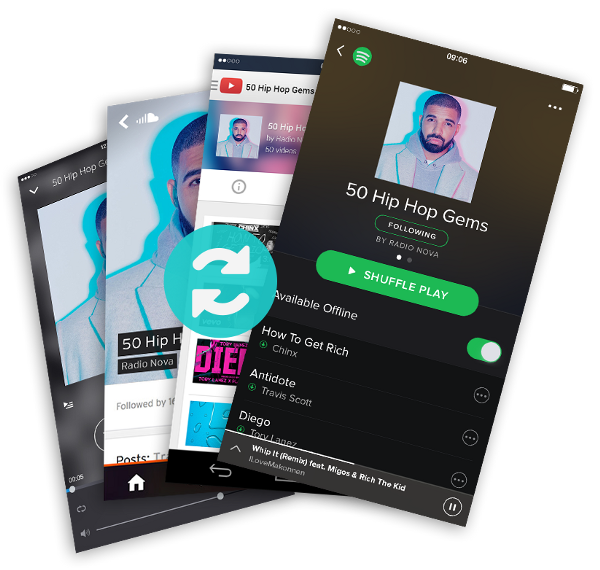 Create and synchronize your playlists everywhere. Grow your audience on Spotify, YouTube, Deezer, SoundCloud and more. Create a new playlist on Soundsgood.co (or import one). Open new channels of audience across streaming platforms. 2. Link your official channels at the bottom left of the Playlist Editor. Note: If you haven’t channels everywhere, it’s time to do so for the sake of your audience! 3. Click on Publish and wait for it… Your playlist are now published and synchronized across each streaming platform! 4. Got new tunes to share? Add new tracks, reorder them, change your playlist title, all those changes are instantly synchronized everywhere. Now that your playlists are available to everyone, we have streamlined the listening cross-platform experience with brand new Play, Save and Follow buttons. 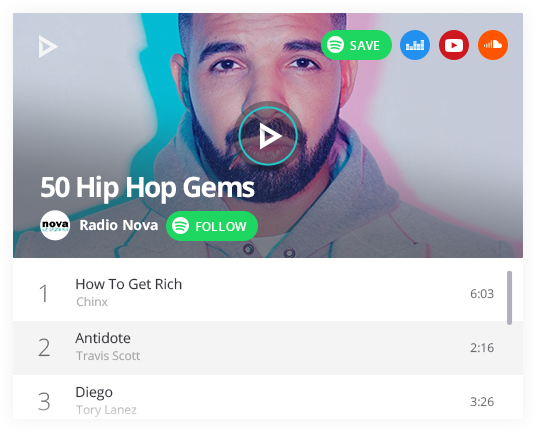 When you embed your playlists on your website or social networks, your fans can easily pick their favourite music platform to stream your playlists. The Soundsgood Save and Follow buttons are automatically replaced by the streaming platforms native ones to grow your communities directly where your listeners really are. Many of you have been asking about a proper mobile experience when sharing playlists withSoundsgood! We still have a lot to do about it in 2016 but here is a start. On mobile, your listeners can directly launch your playlists within their favourite music apps like Spotify, Deezer or YouTube (and save them offline if they have a subscription there). And if you have not synchronized your playlists on these platforms yet, they can still stream our secondary sources or open each track in their apps. We have enhanced the Playlist Editor to give you a complete control over the playlists availability on each streaming platform. Don’t forget to review each track sources across music platforms and make sure that anyone can enjoy your playlists manually adding the sources that might be missing. Various bugs and issues also have been addressed. Be sure to let us know if you encounter any problems that needs fixing. You can also be awesome by helping us by spread the word about Soundsgood. Here’s 2 quick ways to do so! Try it out now! (or dig into our detailed Curator Guide). Follow Soundsgood on Facebook and Twitter.